The Worthington Historical Society has a small endowment, but is mostly supported through memberships, financial donations, building rentals and sales of publications. We invite everyone to join us and participate in our efforts to record and preserve Worthington’s history. We are a 501(3)(c), tax-exempt organization. All memberships and donations are fully tax-deductible. We appreciate your support. Individual memberships are $20, family memberships are $35, and of course we welcome extra donations in any amount. All memberships and donations to the WHS can be paid through the Paypal button below. If you prefer to mail in your contribution, please send a check made out to “Worthington Historical Society” to Worthington Historical Society / P. O. Box 12 / Worthington MA 01098. Please include a piece of paper indicating your name, mailing address, email address, and whether your donation is a new membership or renewal. You can also download our membership form for this purpose at this link. We welcome donations of letters, diaries, scrapbooks, postcards, photographs, paintings and drawings, needlework, furniture, household and farm items, clothing, business records, organizational records, etc. etc. that have a clear connection to the history of Worthington or to people who have lived here. We are also willing to scan and include in our archival or photographic databases items that you may wish to keep but which have historical value and interest to people researching Worthington’s history or their family genealogies. The WHS is a 501(c)(3) nonprofit organization and gifts are tax-deductible; however, the WHS does not provide appraisals. It is the donor’s responsibility to have an appraisal of any donated property for tax purposes. If you wish to donate an item to the Historical Society, please contact any member of the Board of Directors. In 2006, to guide future collections, the Board developed a collections policy that is available for downloading. If you would like to donate an item, please fill out the downloadable Donation Form. Great thanks to all who have donated to WHS. Some recent acquisitions are photographed below. 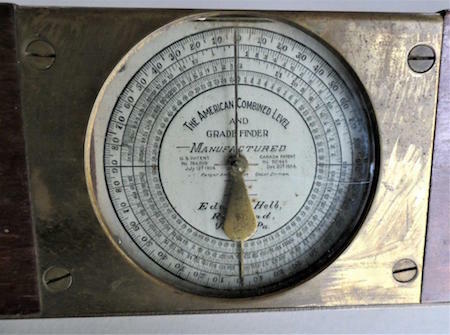 Surveyor’s level with “inclinometer” at the center as well as a sighting tube and compass. Donated by Arlene and Charles Cudworth in 2011. 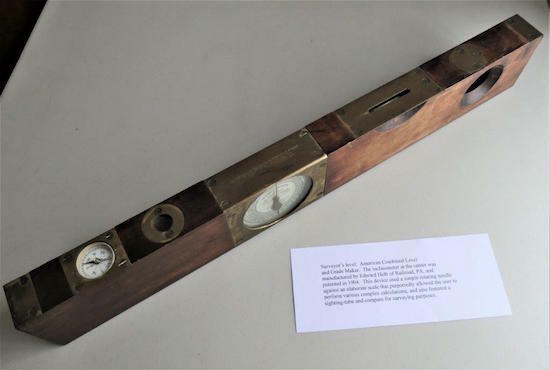 Inclinometer from surveyor’s level, manufactured by Edward Helb of Railroad, PA, and patented in 1904. Donated by Arlene and Charles Cudworth in 2011. 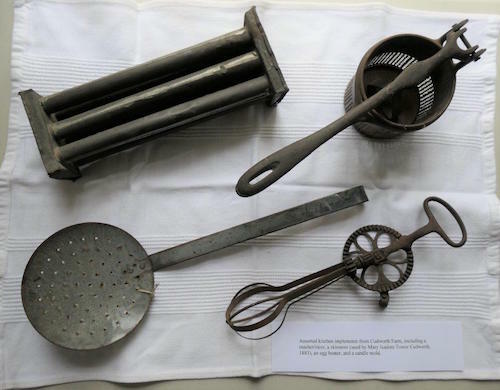 Candle mold, masher/ricer, skimmer, and egg beater from Cudworth Farm. Donated by Arlene and Charles Cudworth in 2011. Letter from the Burr Family Archives, loaned to the WHS by F. Andrus (Andy) Burr for scanning, cataloguing and study. WHS received a grant from the Massachusetts Foundation for the Humanities for this project.